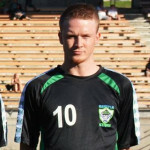 Double-take: Yes, that is EPLWA all-time leading scorer Tyler Bjork – in a Seattle Stars kit! Tyler Bjork has scored 22 goals in his Evergreen Premier League tenure. 20 of those came when he was a member of Bellingham United FC. Now Bjork is back home in the Seattle area, but still in the EPLWA – with Seattle Stars FC. It takes a second to adjust to the new world order when you seen Tyler Bjork’s name on the Seattle Stars FC roster. He led the EPLWA in goals with 13 in the inaugural season of the league, including a might-never-be-broken record of six goals in a single match. Tyler went to Western Washington University in Bellingham after a glowing high school soccer stint (Juanita HS). It was there that he connected with the Hammers of BUFC and then became the stuff of legend. Bjork even led the Hammers in goals last year, too. He scored 7 for Bellingham United in what was a low point season for the club. Now Bjork is back in the Seattle area as life takes him on his next steps. No one in Bellingham will be surprised to learn that he leads Seattle Stars in goals in the early going with two. He’s scored in both Stars home matches at French Field in Kent, one against Olympic and the other goal against South Sound.